If trigonometric functions are something about triangles to you, you first have to change your understanding of them completely. They have much more to do with circles than with triangles (even though the very name "trigonometric" suggests triangles - it's a very unfortunate historic issue). But first things first. The picture on the right shows how you usually learn the trigonometric functions at school. There is a triangle and an angle inside it, and the values of the sine and cosine are the ratios of respective sides. OK, this makes sense. But... what about angles above 90°? Or below 0°? What exactly is sin(100°)? What is cos(-20°)? These functions are defined for these arguments, but how to show it on a triangle? You just can't. 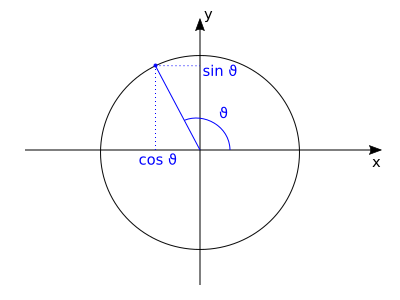 These problems are solved by defining the sine and cosine on a circle (the picture to the left). We take a circle with radius 1 and the center at (0,0). We draw a radius at the angle to the x axis, with the angle growing conterclockwise. The coordinates of the point on the circle that we hit are and . There is no problem with large angles (we can go around the origin of the coordinate system as much as we want), nor with negative angles (we just count them clockwise). We can also look at this from another perspective - when we change from 0 to 360° (we can do so even from -∞ to +∞) and start marking the points with coordinates , we will get a circle. To be more precise, we say that is a parameter, and is a parametrization of a circle. Since we are starting to go deeper into the mathematical language, it's worth mentioning that mathematicians don't really like to measure angles in degrees. The preferred unit is the radian - the angle in radians is just the ratio of the length of the angle's arc to the circle's radius. The full angle is radians, 180° is radians, 90° is ... Actually, mathematicians (and physicists) don't even treat angles as values with a unit, but as "naked" (dimensionless) numbers: they don't say "the angle is x radians", but just "the angle is x", full stop. It makes sense, because a ratio of lengths of two lines (in this case the arc and the radius) is just a number and doesn't require a unit. So now a problem to solve: what is the area of the circular sector that has the angle (the picture to the right)? Let's calculate: the full circle has an area of . 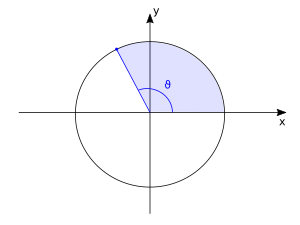 The angle is a part of the whole circle: a ratio equal to (reminder, the full angle is ). This means that the sector's area is . When the radius is 1, as it is here, the area will be just . So if we imagine that we start at and draw a circle until we are at , the area that we will swipe will be . Okay, but what does it have to do with the hyperbolic functions? Well, just as cosine and sine parametrize a circle, the hyperbolic cosine and sine parametrize a hyperbola. Taking different values of a parameter, let's call it , and marking points we will get a hyperbola passing through the point . But there is more - if we start from and move along the hyperbola, swiping the area between it and the origin of the coordinate system, when we reach , the area will be... . This is why I wanted to point out the area issue in the circle - if you look from this perspective, the analogy between the trigonometric and the hyperbolic functions is complete. It is at last apparent that the names of the hyperbolic functions aren't similar to the trigonometric ones by accident. But do they have any practical use? As it turns out, yes they do. 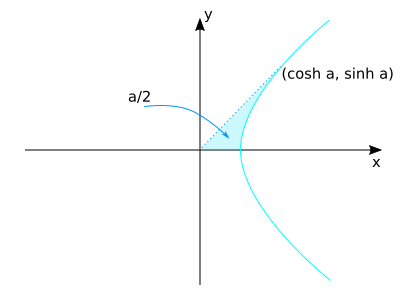 Hyperbolic functions are incredibly useful in relativistic physics - the transformations between two moving frames of reference are strikingly similar to rotations, but expressed with the hyperbolic functions instead of trigonometric. And in other fields: a rope hanging from two points assumes the shape of the graph of the cosh(x) function under gravity - this is called the catenary.